This week I made a bunch of sketches and showed them to my boyfriend. He said ‘that one’, I agreed. This is the crochet badger I have in mind. A sweet and cute looking, chubby little badger. I’ve been thinking much about how to do the colour changes for this badgers head. Should I crochet in two colours right away, so the dark stripes are worked into the design, or should I add the dark stripes later as patches. It’s an issue. Working in two colours usually would have my preference and sewing on patches I sometimes consider as ‘the easy way’ to get a two coloured animal. But, I also think worked in colour changes aren’t an end in itself, and if it limits the design, sewed on patches aren’t such a bad choice. To me the character and expression of the animal is the most important goal. It’s a matter of experimenting to get it right. For example, Floro the red squirrel needed to have a beige nose. In order to try it out, I added a beige patch to a finished head, just to see how the two colours looked together. But by doing that I noticed the added patch gave the squirrel just the right little muzzle. A worked in beige colour nose didn’t add that bit of character, so I choose to use a patch. As for the eyes it’s the same thing. To me a worked in eyepatch isn’t round enough so I prefer to use a patch. Sizing it is much easier too. For the badger I’ll try to work in the colours and I already decided to work in rows for that, because if I crochet in a spiral, the vertical stripes will be impossible to get. If the worked in stripes won’t look good, I’ll use patches. Secretly I think for a badger, sewed on patches will give the best result for what I want, but let’s wait and see. 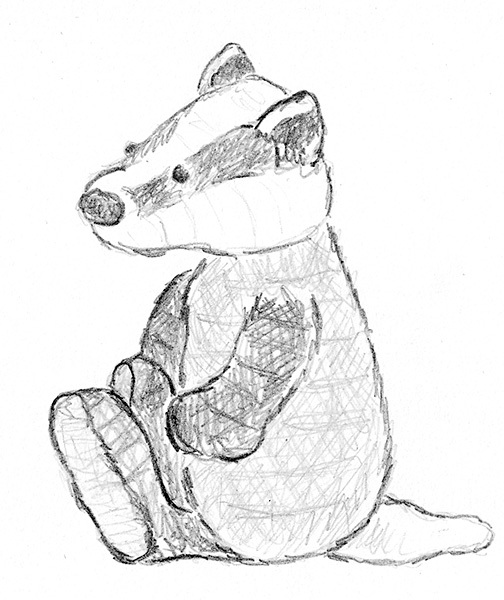 Let’s hope the crochet badger will be much like this sketch, then I love him already!